The Hobbit, The Lord of the Rings, and Tolkien - The One Ring • View topic - Star Trek Into Darkness voted "Worst Star Trek" movie?!!! Re: Star Trek Into Darkness voted "Worst Star Trek" movie?!! Ah Star Trek 5 is pants!But why doesnt anyone like the first one?Its in a lot of ways like a stretched out episode from the series,though the characters dont quite gel this is explained by spocks attempt to acheive emotionlessness or something,and he becomes old spock again at the end.The stretching out is acheived by long,lavish special effects sequences that still look amazing...that is by far the best the enterprise ever looked,and indeed any ship in any film of the era.Accompanying all this is one of the best movie scores ever written,Jerry Goldsmith gave it an epic sweeping granduer and the best star trek opening theme,its on another level that score,and i believe its rightly held in deep respect among the 'soundtrack community'.If theres a critisism,the storys a bit thin,it could have bee condensed into a fifty minute episode without the long efeects sequences,but when the sequences are so stunning and so well augmented with the beautifull score,whats there not to like? Totally fell asleep during Star Trek: The Motion Picture. Yeah, I was that bored. But I got that one a third of the way into the flick. Also, the uniforms were ridiculous. Loved "The Wrath of Kahn". And the special effects wowed me. Love the battle scene in the nebula. Kept me on the edge of my seat, that's for sure. And two hours of Ricardo Montalban is not two hours wasted. I'd recommend the directors cut of ST:TMP that they did a few years ago. It fixed alot of the pacing problems and cleaned up/replaced some of the poorer SFX from the original release and made it a much better movie. And Calma, I can't be the only person who dislikes the WOK - onwards red tunic uniforms, can I? They are horrible. 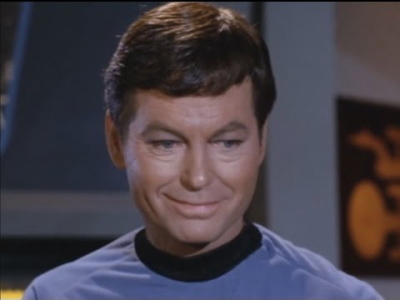 I really like a lot of the uniforms in TMP, especially Kirk's Admiral's Uniform. And I was pleased to see Christopher Pike wearing something very similar in STID. I don't know, Gungnir, you just might be. I agree, Kirk's Admiral's uniform was good, but it was the only one. We do have the director's cut and it still put me to sleep. Pah.For me the treks go in order of greatness thus:2,1,3,4,6,5.A film is made up of visuals,sound and music and so for me the scores are also important,and influence my choice of order.though fives good score does nothing to help it im afraid,the film is just too bad.If i was to order the movies by score alone it would be 1,2,3,5,4,6. You do know that they made more than 6 Star Trek films? And 'First Contact' is, for me, the best Trek film. Gungnir wrote: You do know that they made more than 6 Star Trek films? And 'First Contact' is, for me, the best Trek film. Nah. It was good, but not nearly the best. That honor goes either to Wrath of Khan, or Undiscovered Country. For me, they're both in a close tie for various reasons. series.The next generation is good,it has grown on me very slowly over time,im trying to purchase and see the lot as we speak,and i am enjoying it.I have seen first contact and i did enjoy it,out of the two next generation films ive seen,its the better one (the other is 'generations'). To be honest, Generations and First Contact are the two best TNG films. Insurrection feels like an episode stretched out to 2 hours. And a sub-par season 6 episode at that. Nemesis - well, I quite liked it but it is generally not well regarded amongst fans. And you mentioned the scores of the films - I can't stand the horrible blaring horns all the way through the WOK soundtrack. Really annoying. Coming in to give my tuppence since I very recently watched Into Darkness, which is only my second film in the Star Trek universe after Wrath of Khan. I thought it was a pretty good film. I loved some of the characters - Scotty, Bones and Chekov for instance and the acting for the most part was good. I thought it was absurd to give the role of Khan to Cumberbatch, since he looks nothing like an Indian/Asian, wherever he's supposed to be from. But I LOVED his acting. I think it was mainly his character which kept me engrossed throughout the film. The first half of the film was average, draggy and quite dull. But it becomes enjoyable after Khan's capture. The second act being the strongest part of the film. But the film suffers from far too much visual razzle-dazzle. I can't handle shaky-cam and the film moves from one scene to another at a blietzkrieg pace, many of which are full of eye-blinding multicoloured SFX. Which left me wishing for the film to end soon. That being said, I did like the more calmer and tense scenes, mostly involving Cumberbatch, as opposed to the action scenes. J.J. Abrams may have done interesting things with his reboot of the Star Trek franchise but there's little to really set the new movies apart from any summer franchise flick. They're big, loud and glossy and make little attempt to really replicate the specific elements which made the original movies and TV shows so long lasting. Which is fine - new Trek was invented with the understandable aim of making money and they've managed to introduce these characters to a whole new generation, while also toying with the time line to leave the legacy story alone for fans. But if you're into something a little closer to the original Star Trek, then this is a project you'll want to watch. Star Trek: Axanar is one of the most ambitious fan project ever. In fact, with its recognisable stars, budget and scale its really much more than a fan film - apart from the fact that Paramount own the Trek license. The story is set more than 2 decades before the original series, and focusses on Garth of Izar, a legendary Starfleet captain who Kirk idolised. He charted the cosmos like no other and came to prominence during the Battle of Axanar - a decisive moment in a long standing war against the Klingon Empire. That's the tale creator Alec Peters (who also plays Garth) wants to tell and he's already raised $100,000 via Kickstarter to do it. Now, to get the budget up to the necessary $250,000 he's heading to Comic-Con with a very special treat. Prelude to Axanar. I'm not generally keen on fan films but that trailer is pretty flipping excellent. Part of cramming too much into the film is not stopping to let ideas sink in. Both of these have that problem. Oh, and have I mentioned the stupid amateurish screen flashes recently? But I am tolerant of ST problems, so, if they get enough money and ideas together to do another one, I will go see it. But, I will always think it was a shame to make Kahn Nunien Singh such a wooden, uninteresting character. One of the original's best characters, and the movie ruined him. He is much more than a madman (well, he is a madman, but a lot more than just that). portia wrote: But, I will always think it was a shame to make Kahn Nunien Singh such a wooden, uninteresting character. The main problem I have is with the casting of Khan (though I like BC a lot), in that he looks completely and purely European. I eventually did watch Into Darkness on a flight about half a year ago. Not really as bad as one could have feared bearing the awful 2009 movie in mind. Still missing something to set them apart from the humdrum of sci-fi blockbusters though. Yes. I rationalised it by assuming that, as Khan was a ruler of a large part of the world (in 1996!) his face would be universally recognisable. They changed his name to a western name (John Harrison) to hide his identity, might they not also have changed his appearance for the same reason? And don't forget, Ricardo Montalban was Mexican. But, Portia, he was not, by any stretch of the imagination, wooden or uninteresting, his portrayal was compelling without the scenery-chewing overacting of Montalban. all IMO ofcourse. And Montalban was Mexican, but having brown skin, indeed looked closer to an Indian. Though, I am not that familiar with his ancestry or history. Anyway, I agree. Khan in the film was a classic sci fi villain. I loved his rawness.